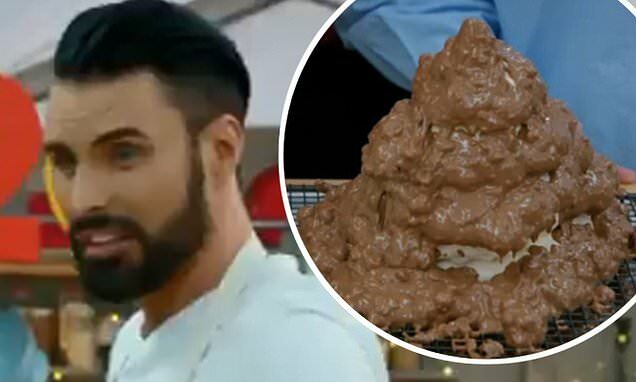 Rylan Clark-Neal leaves the Celebrity Bake Off judges aghast when he presents them with a cake that resembles dog excrement. The presenter, 30, stuns Prue Leigh and Paul Hollywood when he serves up a cake inspired by a rock formation, whose appearance leaves a lot to be desired, on Tuesday's episode of the hit show in aid of Stand Up To Cancer. However, the messy meringue is praised by the judges, with host Sandi Toksvig admitting she thought they would 'poo-poo' the creation. Known for its saucy innuendos, Rylan gets into the show's spirit by joking: 'I love a piping' as he assembles the meringue. Actress Michelle Keegan is the stand-out star of the day with her skiing-inspired meringue mountain with coconut snow labelled 'faultless and exceptional'.